Early career turnover is a serious policy concern for public education — but is it the sole basis on which to evaluate the suitability of teacher retirement benefits? Absolutely not. Our study confirms that most teachers working in California schools today are here for the long-haul, and are better off with a DB pension than with a 401(k)-type plan. Most public school teachers in the U.S. are covered by defined benefit (DB) pensions that offer guaranteed retirement income based on the number of years worked, and the final salary. Importantly, these pensions offer the sole source of secure retirement income for most teachers because they are exempted from Social Security. Teacher pensions also play an important role in women’s economic security more broadly. Seven out of ten California public school teachers are women, and teaching is one of the key avenues through which women workers can still attain middle class retirement security with a DB pension. However, several studies have been critical of DB pensions for teachers, and promoted 401(k)s and similar account-based plans as an alternative. Two such analyses include one from the Urban Institute and another from the Manhattan Institute. In 401(k)s, individual workers bear all of the investment risk, and retirement income is completely dependent on market conditions. However, 401(k)s are more portable than DB pensions, which are normally designed to reward long tenures. Critics rely on high early career attrition to argue 401(k)s are better for “most teachers”, arguing that they don’t stay long enough to collect a decent pension. Unfortunately, the use of the term “most teachers” in those studies, instead of “most new-hire teachers”, is more than a little misleading. When policymakers, parents, and the general public think about the teaching workforce, they most likely think about those teaching in classrooms today. But studies critiquing teacher pensions don’t fully account for this population, choosing instead to focus on those who leave, rather than those who stay. In order to understand how well teachers’ retirement benefits serve the teaching workforce, what we really need to know is whether most classroom teaching positions are occupied by long-term teachers who do well under a DB pension, or by short-term teachers who might be better off with a 401(k). The UCB Labor Center conducted this analysis, with the support of CalSTRS, to find out how California’s teaching workforce fares under the existing DB pension benefit structure, compared to how they would do if the same contributions were made into a 401(k) plan. 1. A large majority of teachers who survive the first few years of teaching, stay until at least early retirement age. The chart below shows cumulative retention over time for a 25-year old new teacher hire in California. This is based on CalSTRS actuarial assumptions, which are based on detailed demographic experience studies on their own membership. Early career attrition is high: Four out of ten new hires stop working in California schools before the end of their fifth year. Inferring from national statistics, about three out of the four teachers who leave, leave the professional altogether. However, a large majority (72%) of those left standing at the end of year 5 go on to teach 30 years or more, that is, until age 55 or later. Looking at turnover rates over time, for different hire ages, yields similar results. 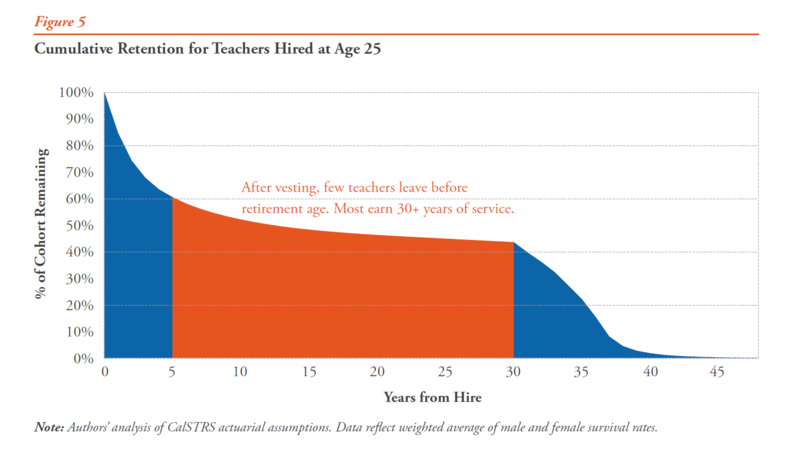 Turnover is highest immediately after hire, and then drops to low rates until teachers become eligible for retirement benefits. 2. The vast majority of teachers working in California classrooms today are here for the long-haul. Very few will leave before age 55. In fact, 84% will vest in the CalSTRS pension plan and stay until at least age 55 with vested benefits. Three out of four teachers will have worked 20-30 years or more by the time they leave California public education. 3. The CalSTRS DB pension, which is designed to reward long-careers, provides significantly higher benefits to most classroom teachers than an idealized 401(k) plan. We modeled an idealized 401(k) plan with average investment returns, no individual investment mistake, only .25% a year in fees, and the ability to buy a life annuity at retirement at a 5% interest rate — very generous assumptions compared to typical, real-life 4o1(k) plans. We assumed the same contribution rate into the DC plan as the current “normal cost” for the DB plan–14% of payroll. * We then identified how long teachers have to work before they get greater benefits from the DB pension than from the idealized 401(k). 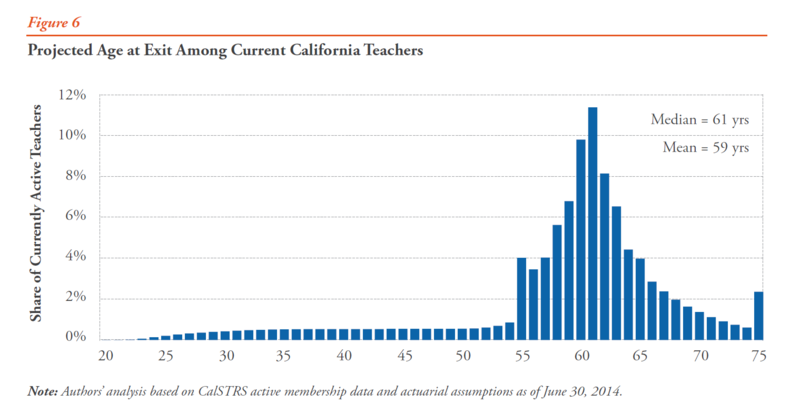 It turns out that CalSTRS pension benefits exceed the 401(k) at age 51 for teachers hired at age 25, and a bit sooner for teachers hired at later ages. Six out of seven California teachers working today will vest in the CalSTRS pension and work until at least age 51. In other words, six out of seven California teachers (86%) are better off with the DB pension than an idealized 401(k). So yes, DB pensions are backloaded; as the chart above shows, DB pensions grow in value the most towards the end of a teacher’s career. 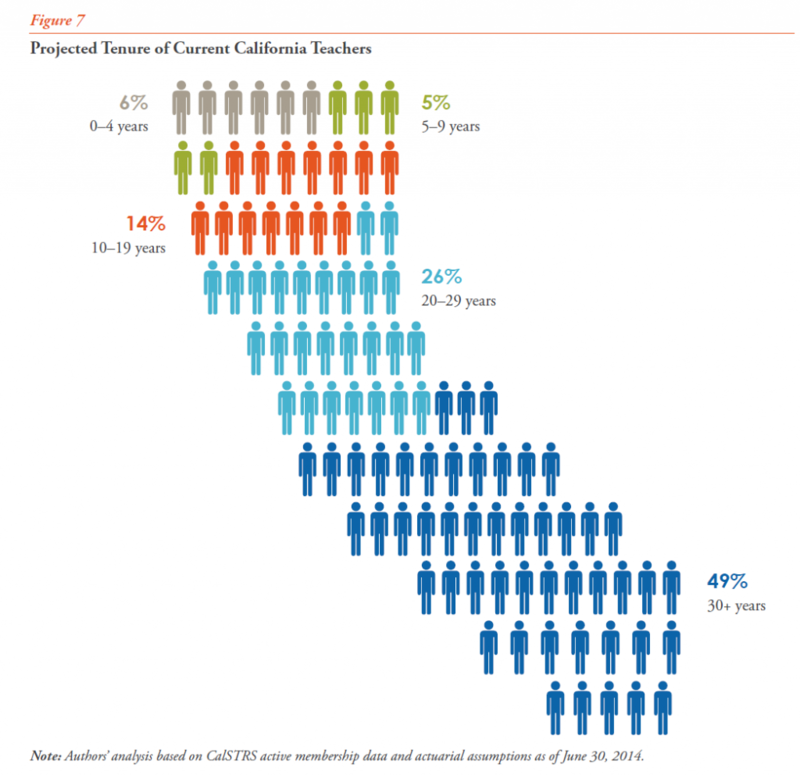 But does this mean that most California teachers are better off with a 401(k)? Far from it. The vast majority of teachers working in California schools today will see higher, more secure retirement income from their CalSTRS DB pension than they would from the best 401(k) plan. *Schools and the state also pay extra for the pension system’s unfunded liability, but that is mostly due to the fact that the state and schools fell short on actuarially required contributions for decades–a structural problem that was recently solved through a funding agreement between CalSTRS and the state. This contribution would be required even if the state froze the DB plan and switched to a 401(k) style plan, and is thus not counted as part of the cost/benefit calculations.